IWATSU | AEX Communications, Inc.
Iwatsu’s ECS system is an extremely reliable (Japanese quality from in house manufacturing) and features a rich system that can function as either a traditional telephone system or as a pure IP system or as combination of the two. It is the backbone of AEX’s Hosted VOIP service. 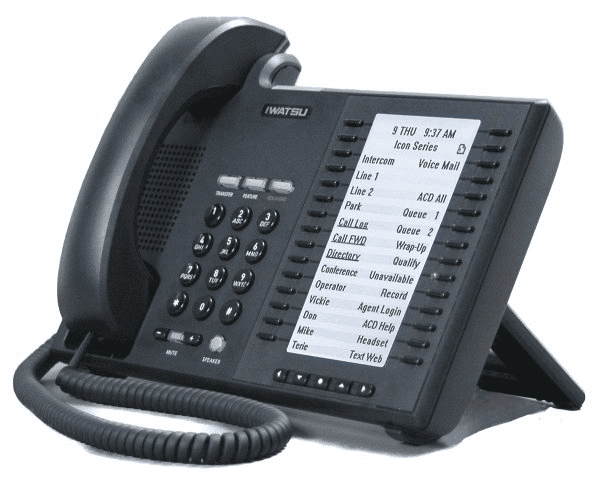 It supports traditional analog lines as well as T1/PRI circuits and SIP trunks as well as 10 to 600 analog, digital, IP, and SIP phones to provide maximum user flexibility. The 5930’s has 30 self labeling context sensitive buttons with dual color LED lights that are ideal for showing the status of other local and remote telephones and one touch intercoming with no need to look up extension numbers.